Since it’s Star Wars season (no spoilers please), I’d like to propose that the 1522 Ottoman Siege of Rhodes is the Empire Strikes Back of the Ottoman-Knights Hospitaller relationship. First there was the 1480 Ottoman siege of Rhodes, which ended when the plucky (?) and heavily outnumbered Knights managed to not just survive the siege, but actually drive the Ottoman attackers back to their ships and off the island. And the capper was the 1565 Great Siege of Malta, when another heavily outnumbered band of Knights managed to survive the siege long enough for a Spanish relief force to drive the Ottoman attackers back to their ships and off the island. But just like the original Star Wars trilogy, the middle episode went to the empire; this 1522 siege drove the Knights off of Rhodes and forced them to find a new island to call their own. The Knights Hospitaller wound up on Rhodes in 1309, shortly after the last Crusader kingdom in the Levant, Acre, fell to the Mamluks (in 1291). At first they’d tried making a new home on Cyprus, but they quickly got sucked into a bunch of courtly drama there, and decided to head off to a more, well, hospitable locale. “Hospitable,” get it? Because their name is…ah, whatever. Anyway, Rhodes was an inviting target, and the Knights were able to capture the island after just a couple of years of fighting, at which point the Knights Hospitaller became known as the Knights of Rhodes. That map up there shows why the Knights’ presence on Rhodes was pretty intolerable for the Ottomans–Rhodes is really close to Anatolia, and moreover it’s very well-positioned for any group that, hypothetically mind you, might want to, I don’t know, disrupt Ottoman ship traffic in the eastern Mediterranean. Getting the Knights off of that island was among Mehmed the Conqueror’s first priorities after he captured Constantinople in 1453. That 1480 siege went bust because the Knights were well-fortified and the Ottomans brought an attacking force of, at most, 70,000 men, and probably more like 20,000 or 30,000. That lowest figure, by the way, would have meant that the Ottomans “only” outnumbered the Knights 10-to-1, to give you some sense of how impressive the Knights’ successful defense really was. Mehmed’s death in 1481 seems to have moved “capturing Rhodes” to the Ottomans’ back burner. His successor, Bayezid II (d. 1512), was preoccupied with consolidating the empire in the wake both of its recent territorial expansion and the nasty civil war that followed Mehmed’s death. Then, Bayezid was followed by Selim I (d. 1520), who focused on fighting other Muslims (the Safavids and the Mamluks, specifically). It fell to Suleyman the Magnificent (d. 1566) to complete Mehmed’s work and drive the Knights of Rhodes off of Rhodes. Suleyman succeeded where Mehmed had failed in large part thanks to numbers. Where Mehmed’s army was 70,000 strong at a (very unlikely) maximum, Suleyman sent a minimum of 100,000 men to take the island. Despite the fact that the Knights had made several improvements in their fortifications since 1480, and despite the fact that their Grand Master, Philippe Villiers de l’Isle-Adam (d. 1534), was pretty sure that an Ottoman attack was imminent, an army of that size just couldn’t be held off. 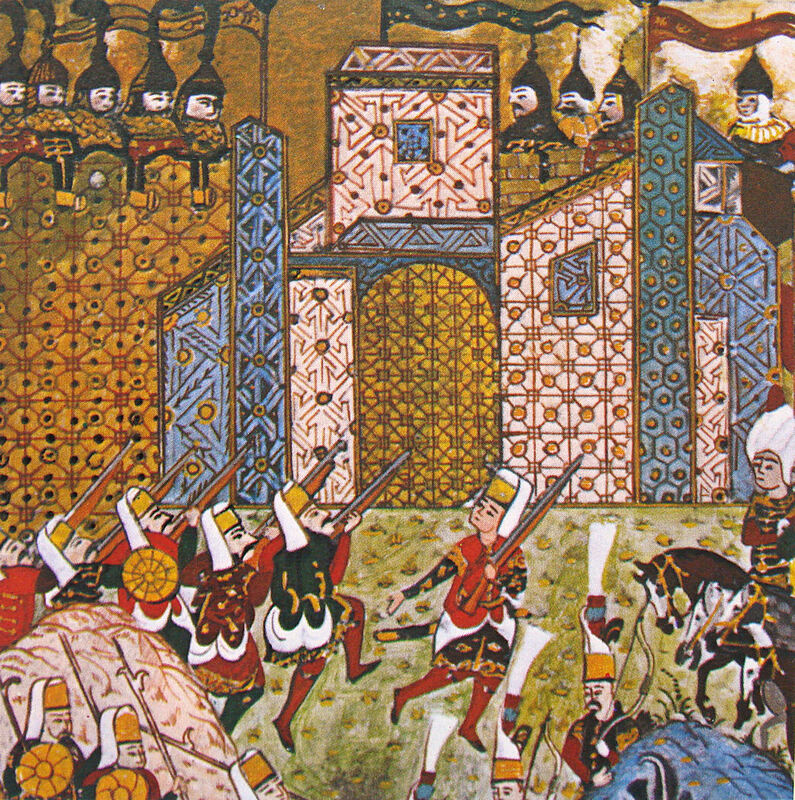 Nevertheless, the Knights did hold the Ottomans off, for nearly six months–the siege started in late June–and they repelled at least two full-on Ottoman assaults against parts of their walls that had been collapsed by artillery fire. In late September, Suleyman, who was there to personally oversee the siege, fired (and nearly executed) his top commander, Choban Mustafa Pasha, for failing to take the island after three months, and appointed as his replacement one Ahmed Pasha, who had a great deal of experience as an engineer. Ahmed Pasha’s plan was to undermine the walls and destroy them from below. The walls were systematically destroyed, but the Ottoman still couldn’t take more than an isolated rampart or two before meeting stiff resistance from the Knights. Say what you will about the whole Crusading enterprise (I have, several times), but the Knights Hospitaller were clearly an impressive fighting force. By December, everybody had pretty much had enough. The Knights, who’d started out with around 7500 men and had lost 4/5 of them, simply couldn’t maintain their resistance, and there was no Christian relief army on its way as there would be at Malta four decades later. The Ottomans, despite having a ridiculous edge in guns and manpower, were frustrated and tired of taking casualties without making any real gains. And, you know, the people of Rhodes were tired of suffering collaterally while these two armies continued to pound each other. So Suleyman proposed a deal: the remaining Knights could leave a place that they could no longer defend, and Suleyman would let them go in peace, with their weapons and religious items. Further, the Ottomans would promise not to enslave the people of Rhodes nor to convert any churches on the island to mosques. Villiers de l’Isle-Adam agreed, if for no other reason than the people of Rhodes might well have turned on the Knights themselves if he hadn’t. The capture of Rhodes consolidated Ottoman control over the eastern Mediterranean, and for an empire that had only just added Egypt to its control in 1517, taking Rhodes and clearing up the direct shipping lanes between Egypt and Constantinople was a very big deal. The Ottomans eventually conquered Cyprus in 1571, and thereby turned the far eastern Mediterranean into more or less an Ottoman lake. Today Rhodes belongs to Greece, after being taken by Italy during the Italo-Turkish War in 1912, then briefly being occupied by Germany and then Britain during World War II. Suleyman gave the Knights a couple of weeks to collect their things, and they finally departed for Venetian Crete on January 1. The search for a new island was on, and the stakes were enormous–they knew that without a new home, they’d have to just go by “The Knights” from then on, and that’s really a pretty silly name. They wound up settling on Malta–as the Knights of Malta, disaster averted–as vassals of Holy Roman Emperor Charles V. Malta, coincidentally, was also very well-positioned for anyone who wanted to harass Ottoman shipping, in this case sailing to and from Tunisia, or for anybody who might want to resist an Ottoman naval advance into the western Mediterranean. So it was inevitable that Suleyman would eventually chase the Knights there and once again try to run them off. The Ottomans unsuccessfully besieged Malta in 1565, and Suleyman died in 1566, which is kind of a weird parallel with the unsuccessful first siege of Rhodes, which took place in 1480 and was followed by Mehmed’s death in 1481. There must have been something about fight the Knights Hospitaller that sent Ottoman sultans to their deaths shortly afterward. Wishing you and yours a Merry Christmas (or a Happy Holidays, or which ever salutation you prefer: the intention is only to do good).